Looking East into downtown St Paul. The road is Highway 94. I was trying out some of the new settings in my photo editing software, Picasa. One of the new image processing ideas, gives the blooming fields of purple, quite a different look and feel. 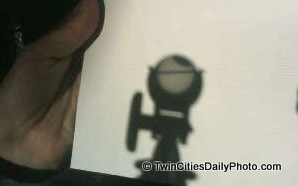 The quality is terrible, but my kids and I were checking out the partial eclipse on Sunday, May 20 2012. We used a small telescope and a piece of paper. My daughter took the photo with her 1.3MP camera phone. I had never tried it before, it's crude, but it actually works!! The line across the sun is an electrical wire. Once the wire was out of the view, then the trees were in the way. It was an enjoyable time with the kids. A distance view of the Cathedral of Saint Paul. Looks like this one is a bit dated, as I see many wearing jackets, while our weather here is climbing near 80F degrees. I've posted a similar photo of the St Paul Cathedral a few years ago, actually over four years ago. I was around the area again, photographing the surroundings, and couldn't pass the opportunity of this photo. Seeing the group of people, pointing and looking up at the facade, really made this one stand out too me. Build your dream home right here!!! Judging by the lot surroundings, I'm not surprised by the looks of the sign. Found this on a light pole near downtown St Paul. Kind of a strange one, a US Mail label with Graffiti on it. This one is a couple months old now, but it was from the Minnesota Wild versus the San Jose Sharks hockey game. Not sure how much of these flyer are still relevant. Someone needs to clean this up and start over.